When I read these Labour leaflets I just recall what I wrote in the following blue box which is taken from one of my leaflets. Today after the recent election only 1 Labour Councillor was voted onto Hampshire County Council. Had I lost the election for Aldershot East I presume there would have been 2 Labour County Councillors on HCC. I just cannot understand how this one person isolated in this tiny group can possibly obtain all these objectives outlined in these Labour leaflets. The whole purpose of this page is to point out that a lot of these objectives are simply unachievable only because some of them are already being implemented by HCC and others would just not happen in the real world. The Labour party is so good at raising peoples expectations and hope always in the end resulting in failure. Nationally and locally we have had 11 years of spin, no wonder the general public have such a low regard for politicians. The independent body which oversees the behaviour of politicians outside Parliament which is the Standards Board for England are not allowed in their remit (a remit created by the labour Government) to control what politicians say in their literature particularly at election times. Therefore politicians and political parties are allowed to publish in their leaflets inaccurate and misleading information. The only control appears to be the civil libel laws which does seem to stop politicians and others making inaccurate and nasty comments about people and naming them. The UK economy recorded its sharpest decline in more than 50 years during the first quarter of 2009, figures today from the Office for National Statistics. In 2007, Britain’s GDP(Gross Domestic Product) topped the global wealth table of the G6 nations, when her per capita GDP was $45,970, even higher than the U.S.
Today it is less than $34,000 and going lower. Result a week and sliding pound. How does that effect us? The end of cheap times abroad for British holiday makers. A constant rise in prices for imports will lead to more job cuts as retailers seek to cut prices and increase profits by cutting more jobs. Out of 78 on Hampshire County Council. 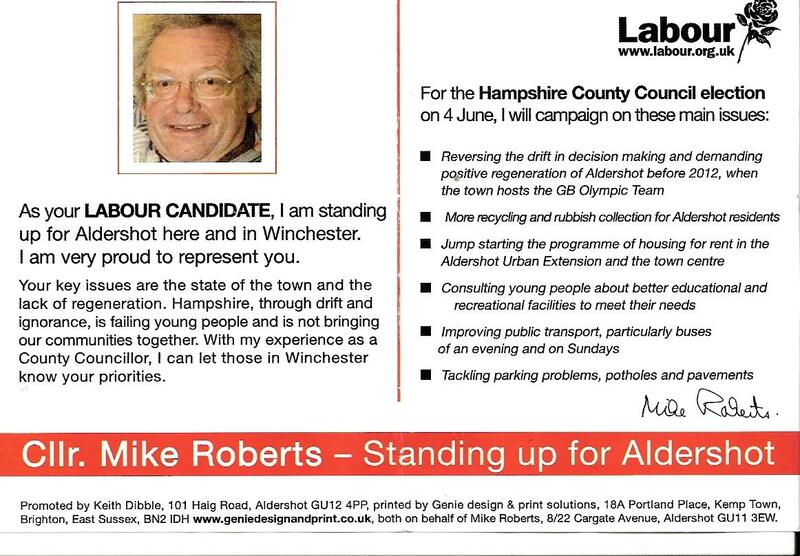 Thanks to the people of Hampshire Labour have no SAY or INFLUENCE in Winchester. Small Labour Leaflet approximately 4"x 6"
I want Children's Services to be strengthened by improving the skills and the professionalism of their staff. There must be NO "Baby P" cases in Hampshire. Our children deserve better. The tragic death of Baby P took place in the London Borough of Haringey which is Labour controlled. The labour Government immediately after this tragic death asked the Leader of Hampshire County Council to allow the Head of its Councils Children’s Services to go to Haringey and take over until a new officer in charge could be appointed. Why? Because Hampshire County Councils Children's Services are probably the best in the country. That is why a Labour Government came cap in hand to a Conservative Controlled County Council to ask for their help. Of course we agreed to their request. 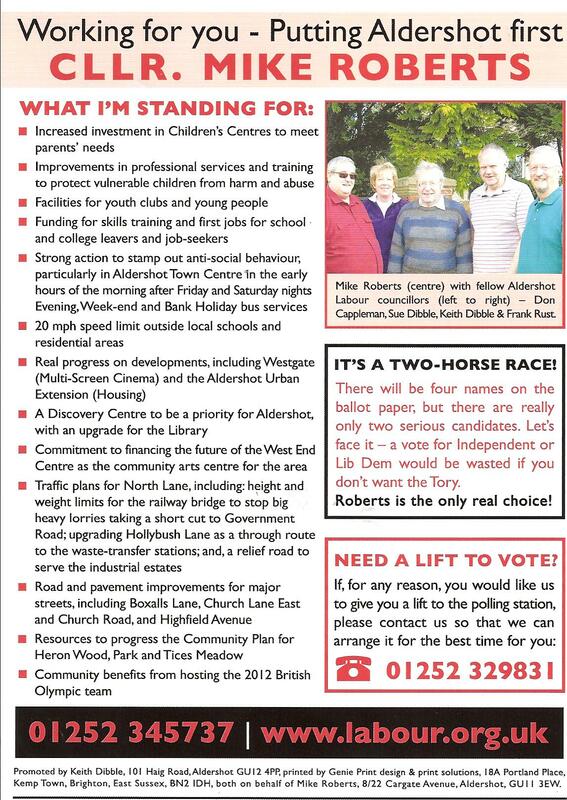 Yet here we have the Local Aldershot Labour Party promising to sort out HCC’s Children’s Services! The whole Country was upset because of this tragic death. Why would a group of people raise a matter like this and in doing so imply that HCC's Children's Services were inadequate? The need for good services for older people is a big issue now, and I want Hampshire to take a positive approach. HCC's Adult Services are regarded by the Audit Commission to be one of the best in the UK. I don't think some people appreciate that on our very doorsteps in Heron Wood we have Ticehurst Nursing Home. Expanded and re-furbished 2 years ago to accommodate some 70 residents, many of the individual units have on suite facilities. Place Court, Pool Road, Heron Wood (extra care housing/ and assisted living) in conjunction with First Wessex/Pavilion Housing Association, HCC's Adult Services will be providing 24 hour care. "I've already discussed no fewer than 14 essential traffic schemes with Rushmoor and Hampshire," he said. "But so far nothing has been forthcoming. The lack of concern is disgraceful! 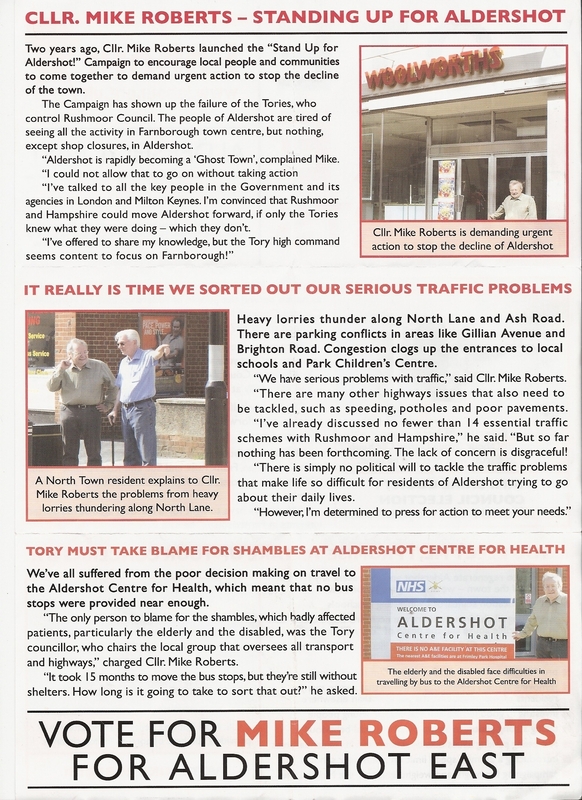 "There is simply no political will to tackle the traffic problems that make life so difficult for residents of Aldershot trying to go about their daily lives. "However, I'm determined to press for action to meet your needs." Tackling parking problems, potholes and pavements. Hampshire County Council spends annually £56 million maintaining Hampshires roads and pavements, much of that money comes as a grant from the Labour Government. The County's Highways have been assessed as the 4th best maintained of all County Councils. I would love to spend more money on our roads if the County had it. This Labour Government recieves billions in taxes from the UK motorist and only spends 8% of that money on maintaining the Nations roads. We've all suffered from the poor decision making on travel to the Aldershot Centre for Health, which meant that no bus stops were provided near enough. The only person to blame for this shambles, which badly affected patients, particularly the elderly and the disabled, was the Tory Councillor, who chairs the local group that oversees all transport and highways." Charged Cllr Mike Roberts. In the original plans of the Aldershot Centre for Health there was an oversight of the location of the two Bus Stops. As soon as it came to the attention of the Committee I Chair which consists of the 10 County Councillors from Rushmoor and Hart. We actioned the immediate placement of new Bus Stops, these highway works were completed within 6 weeks of our meeting. Regretfully although the shelters are available to be erected, on a parcel of land that one of the shelters will be erected on there has been a legal ownership problem. Which is taking a long time to sort out - to long. Some people seem to forget that these new bus stops outside the new Centre for Health are actually nearer than the high street bus stops used for the old Centre for Health! My Committee put forward a number of points concerning travel and parking, one was a survey to find out if people were having difficulty in traveling to the new Centre for Health. This survey was carried out some months ago. Surprise, Surprise, no one seemed to be having any travel problems? Only one person has ever contacted me about travel problems to the new Centre for Health and I was able to put them in contact with a voluntary group to assist. 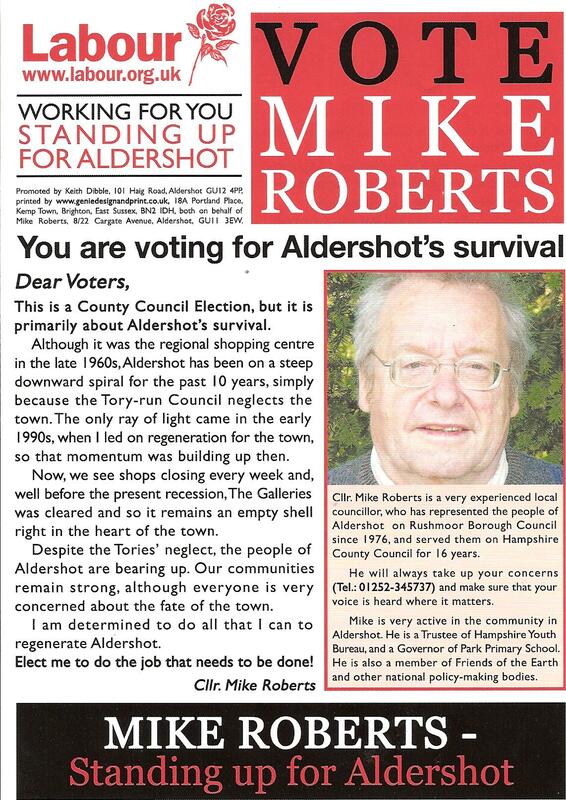 Supporting the people of Aldershot in tough times. The foreground of that picture with the Labour candidate and the elderly Lady, is that not the Abbey Bank in Farnborough? As a school governor, I believe that there should be more emphasis on pupils reaching their full potential rather than working to narrow national tests. As a County Councillor I have access to the list of all School Governors in the County Division of Aldershot East. 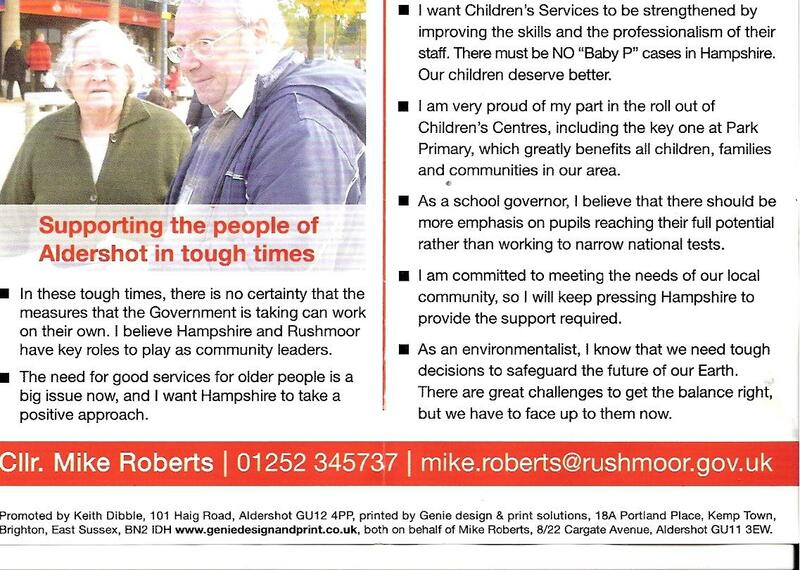 As far as I know this Labour Candidate is not a School Governor in Aldershot? I am therefore appalled by the arrogance and the ignorance of many MPs, whose extravagant claims for allowances and expenses show that they are totally out of touch with the realities of life that we face. Possibly for the first time ever I actually agree with something the local Labour Party have said. 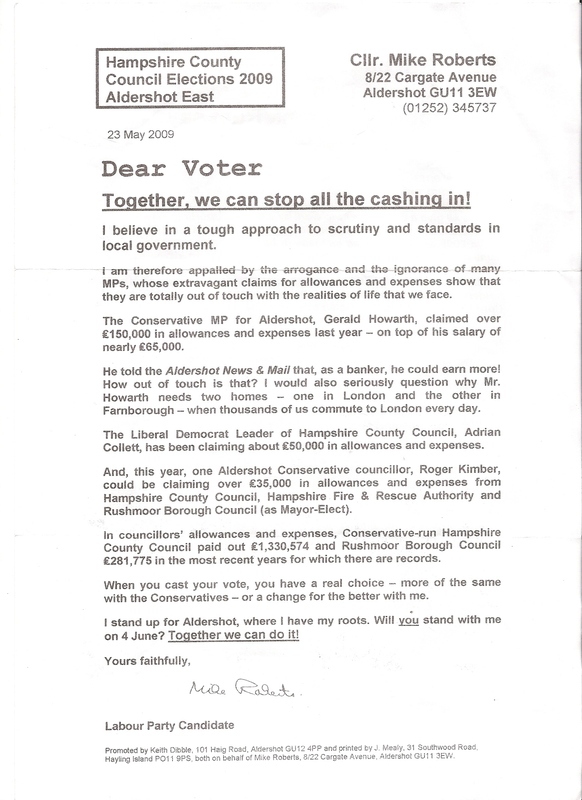 The Conservative MP for Aldershot, Gerald Howarth, claimed over £150,000 in allowances and expenses last year - on top of his normal salary of nearly £65,000. He actually claimed £150,017 in allowances and expenses, this gave him a ranking of 268th out of 645 MPs in 07/08. Whilst Labour's John Denham MP Southampton, Itchen (Secretary of State of Communities & Local Government salary £138,724) came in 196th on claiming allowances and expences with £154,260. "Our Group Leader, Keith Dibble, volunteered to take a 20% cut in his special responsibility allowances. The Labour Group proposed that all holders of special responsability allowances should take a 20% cut, but Conservative councilors rejected this proposal. All allowances for Councillors on Rushmoor Bourough Council are set by a independent body, a remuneration committee (no Councillors are part of it). The special responsibilities allowances paid to the leader of the Labour Group Keith Dibble is £3000 per year. To lead just 4 people. Even with this self imposed cut of 20% the amount is still I feel excessive, £2400 a year to lead 4 people? 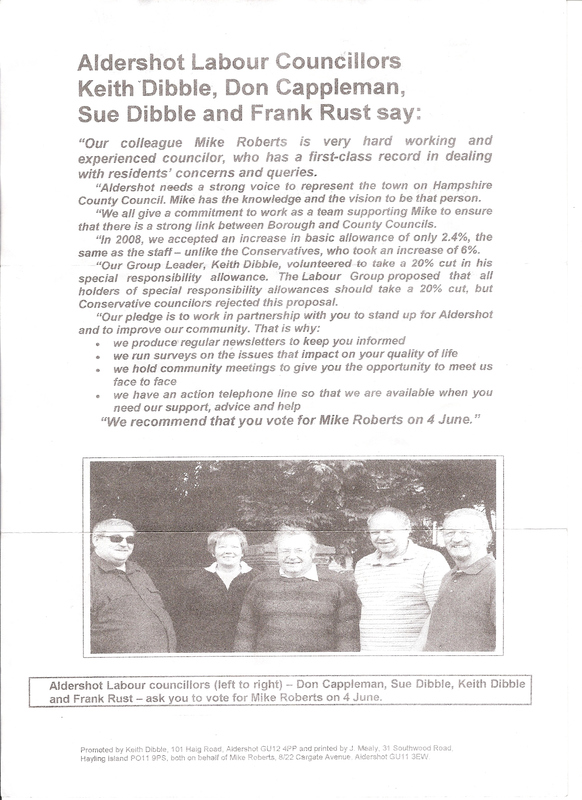 I read with interest Cllr Keith Dibble’s letter the News 6th February in it he seems most upset with Hedy Brennan for pointing out he received a considerate amount of extra money from Rushmoor Borough Council on top of his basic allowance for being Labour Leader of only 4 Cllrs. He stated he had taken a voluntary cut of 20% in this annual allowance of £3,000, that is very good of him I presume he must have felt a little guilty. I pointed out in my own letter to this paper that the Labour Leader of Gosport received £753 per year for leading 3 Cllrs, is not Cllr Dibble still being paid £2400 for doing something similar? There is not a child casualty problem outside of schools three year data showed that of the 1845 child casualties ( 4 - 16 years) showed that 103 identified outside of schools of which 94 slight injuries - this shows that the majority of accidents for children are away from schools - therefore a 20mph would not help that much. The other issue with 20mph outside of schools would have to consider with an order when it would apply - such as 0800 to 0900 and 1500 to 1600hrs - not weekends and school holidays - this would make any traffic orders very complicated - also difficult for drivers and riders. It's my understanding that Hampshire Police are reluctant to enforce 20mph speed limits simply because they haven't got the resources. Particularly now when the Labour government cut £10 million from this years police budget for Hampshire. At most schools sites there is traffic mayhem at school times - however there has been a long held belief that this mayhem helps in calming the traffic and generally making the area safer for children ( not safe but safer) - if the vehicles where moved away there is always a chance that the speed of traffic would speed up making the environment less safe - an argument for leaving well alone. The 20's Plenty scheme really is to target drivers and riders to get them to recognise a school are and recognise that 20mph is plenty at school times - if we are to be successful in getting people to drive slower then all of us who are drivers have to commit ourselves to driving slower but this is a long term commitment - experience has shown that the majority of people who speed are locals to an area. How effective are 20 mph speed limits in residential roads? Some years ago on a large estate in Portsmouth 20 mph speed limits plus traffic calming measures were imposed. Over a 3-year period it was noted there was no notable reduction in traffic accidents, which is similar to other estates in the UK where 20 mph schemes are in operation. Regretfully and for obvious reasons drivers aged between 19 and 27 are the cause of many accidents on our roads. In this area and across the UK about 1 in 10 people are driving without motor insurance and there is a small number that drive without a license. This can be borne out by the increase over the years in ‘hit and ran’ accidents. Of course the police are aware of this and are taking action but the problem is huge. Would a 20 mph speed limit stop these drivers from speeding?